Mary Anne Radmacher – We Are All Meant to Shine! This has been one of my favorite quotes for many years. 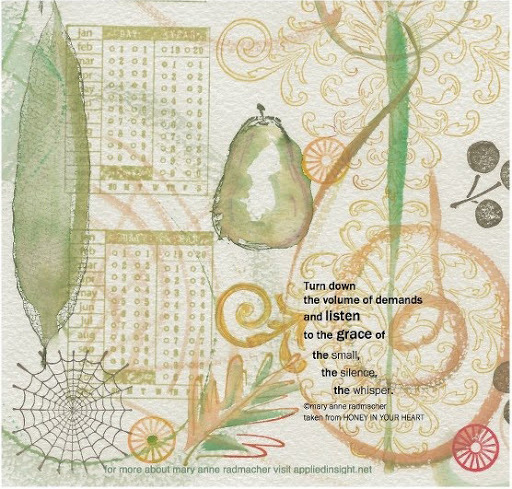 Artist and writer Mary Anne Radmacher has inspired me for many years with her writing and her art. Many of her books are included in my library of favorites. 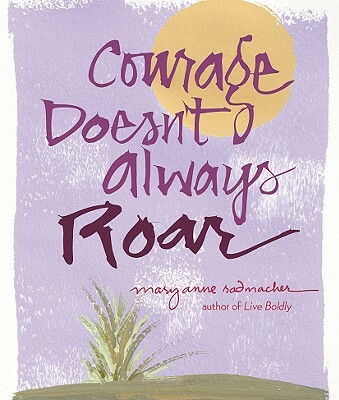 Yet it is only recently that I picked up a copy of her book called Courage Doesn’t Always Roar. I was incredibly moved and thrilled to read an expanded version of this very quote in this book. I felt a bit stunned after taking it all in. Hmmm…let those words linger promise of tomorrow. 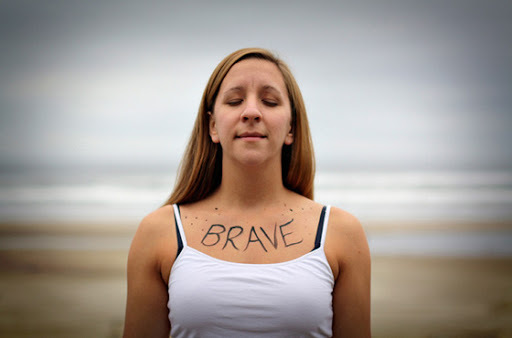 Now let us journey together further into the exploration of courage with Mary Anne Radmacher…. of the weighty parts of your past. to find your own voice. that you have set aside. to recognize that rigid habit inhibits. does not determine the way you are. 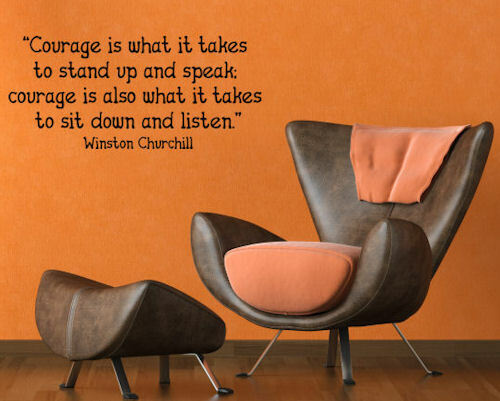 It takes courage to stand for your convictions. It takes courage to give up control. and understand that everything is washable. comes in the most ordinary moments. Courage is content to make no excuses. 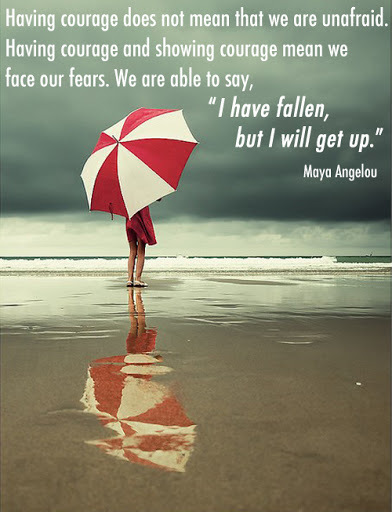 is the most ferocious response to fear. Courage laughs right out loud. and let possibilities discover you. to wander and parades will find you. 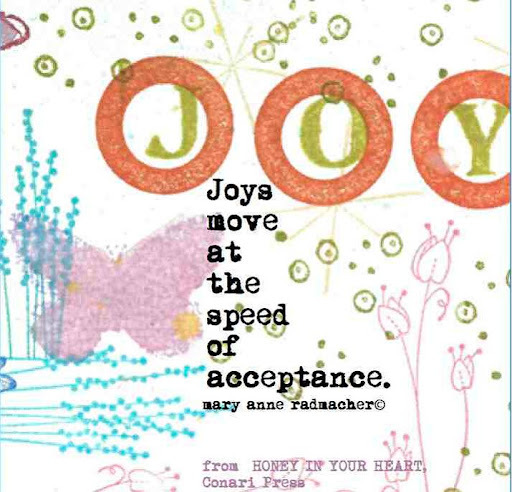 Mary Anne Radmacher has touched the hearts of tens and thousands with her popular cards, books, posters, journals, and gift books. 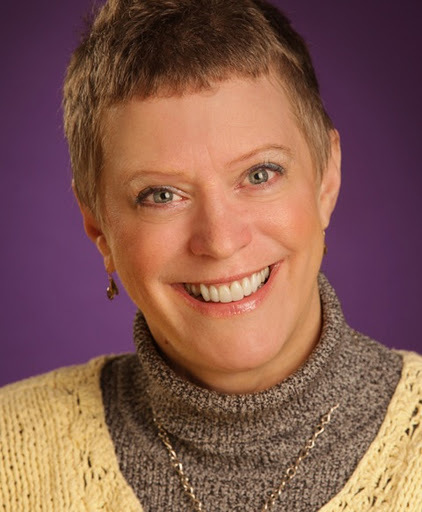 She conducts workshops and writing seminars on living a full, creative, and balanced life. A new year is approaching. 2013 will be here within a week. Stay true to your voice. What is it that you want in 2013? Now is also a great time to write yourself a series of Permission Slips! Be courageous. Set yourself free to be you ~ and to do those things that make you happy…and then let the rest be. You can just let it be. I give myself permission to be different than I was 10 years ago. I give myself permission to like and love who Michelle is today. I give myself permission to not be perfect. I give myself permission to love my imperfect and over-sized body. I give myself permission to be content. I give myself permission to be an imperfect parent and partner. I give myself permission to lighten up. I give myself permission to not get it all done. I give myself permission to write without editing. I give myself permission to relax and have fun. I give myself permission to make mistakes AND NOT beat myself up about them. What would you include on your Permission Slip list? Does the pace of the world ever seem frenetic to you? Do you ever find yourself struggling in order to keep up with emails, texts, blog posts, facebook posts, on-line classes, and phone messages? Do you ever find yourself filling every moment of your day with the many forms of communicating and social networking that are now possible? While driving or at stoplights do you talk on the phone, text, check email, or surf the web? Do you ever feel inundated by too much information and too much stimulus? Perhaps too many offers to participate in this or that teleconference or amazing life-changing workshop? Do you ever take time to just sit? Do you ever take time to just think? 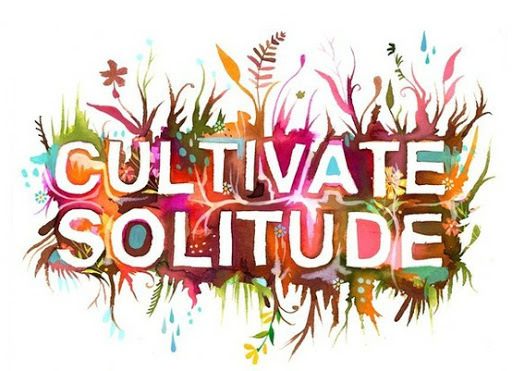 Do you ever carve out quiet time? Does the idea of quiet time seem far-fetched, because of the demands of your life? 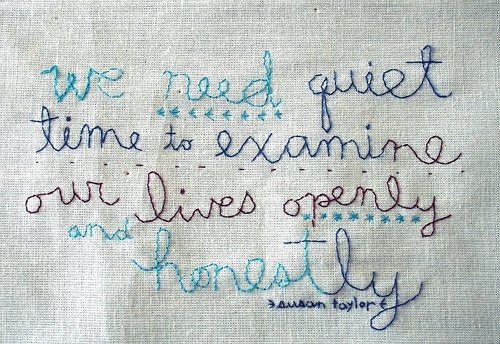 Is quiet time something you long for or is it something you would dread? This piece started to percolate in my mind after reading that a favorite author of mine by the name of Brene Brown was struggling with being on all the time. She was finding herself checking emails or the web at stoplights. She was filling every moment with communicating in some form or other. Just the thought of doing those things sounds crazy making to me. I wondered, when does she get down time, quiet time, time to just think? 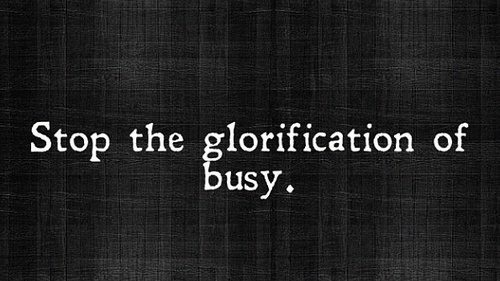 It made me wonder how other people balance out being busy, with taking necessary time out for oneself? Once a week, for work, I have an hour drive out of town and then I turn around and do it again in the afternoon to return home. While the drive can sometimes get stressful due to driving conditions, for the most part, I use this time to simply listen to music and think thoughts. I may come up with a new idea for an article. I may ponder something. I might imagine a new painting. I may try to work out a problem in my mind. The idea of using that time to communicate with others is not at all appealing. This for me is a perfect time to be unreachable. Is quiet time at all important? Are we humans missing out on something if we fill our days with constant stimulation such as pinning pictures, reading status posts of friends and family, texting till our fingers are numb, talking on the phone at all hours, or signing up for every teleconference that hits our in-box? Why would the Dalia Lama believe such a thing? 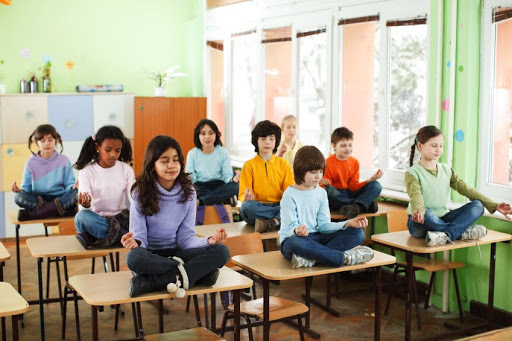 Would a violent free world really be the result of all the children meditating? Would meditation really change them and our world that much? “Meditation is a powerful adeptness for anyone and we are learning (remembering really) that when we have this modeled to us as children the reverberations are profound! It seems that with meditation or even just the practice of getting quiet regularly, allows you to center yourself. BJ Gallagher at the Huffington Post wrote a brief post titled Buddha: How to Tame Your Monkey Mind that explains more. Buddha showed his students how to meditate in order to tame the drunken monkeys in their minds. It’s useless to fight with the monkeys or to try to banish them from your mind because, as we all know, that which you resist persists. Instead, Buddha said, if you will spend some time each day in quiet meditation — simply calm your mind by focusing on your breathing or a simple mantra — you can, over time, tame the monkeys. They will grow more peaceful if you lovingly bring them into submission with a consistent practice of meditation. Do you long for more peace in your heart and mind? Are there things that feel unsettled for you? Do you feel content and happy most of the time? Do you have time in your life to just be, to dream, to imagine, to just breathe? What would it really take for you to start a meditation practice of your own? 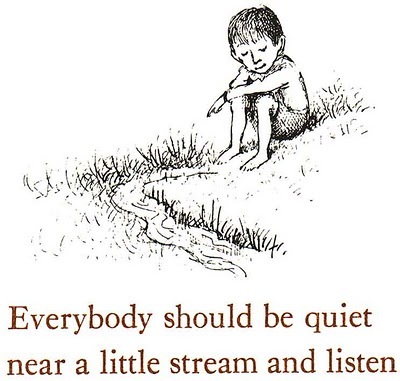 What would it take to simply ensure that you get quiet time regularly? I set my own sail. I choose. I govern. I see through a lens of my choosing. I make no one else’s decisions for them but I set my own sails. And perhaps tomorrow I will set a few less alarms for myself! Writer and artist Mary Anne Radmacher shares that people have asked her over the years how she maintains a cheerful outlook in the face of clear and occasionally discouraging circumstances. Her response is that her book called Honey In Your Heart: Ways to See and Savor the Simple Good Things is her visual, concise, inspiring answer to that question. Writer and artist Mary Anne Radmacher shares that people have asked her over the years how she maintains a cheerful outlook in the face of clear and occasionally discouraging circumstances. 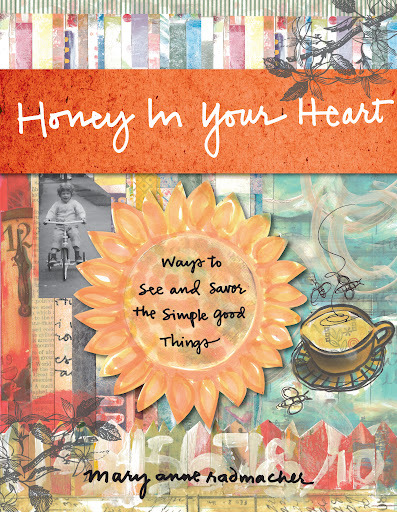 Her response is that her latest book, only just released on January 24, 2012, called Honey In Your Heart: Ways to See and Savor the Simple Good Things is her visual, concise, inspiring answer to that question. Honey In the Heart is a beautiful book filled with the inspirational writing and colorful art of Mary Anne Radmacher. 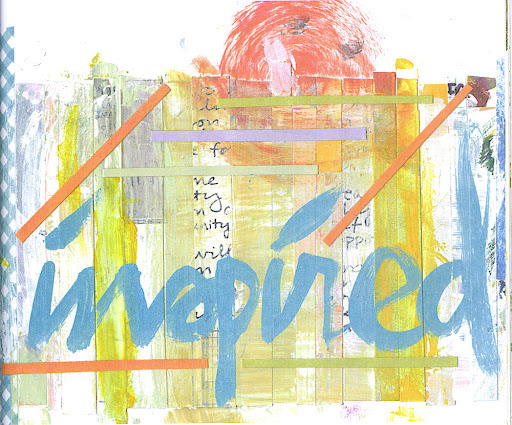 Here is an example of beautiful word art that appears in the book. My pain stays in my wardrobe. The painful lyrics line my shelves. For in the telling of the tale, pain feeds its weary soul. soiled beauty I garden on. My pain’s been ever with me. but today – I’ll leave it here. The book closes beautifully with these words in the Afterword from Mary Anne. I have long admired writer and artist Mary Anne Radmacher. Her writing and images have been in my life for a very long time. One of the things I most love about technology is how I have been able to connect more personally with some of the writers I love most. Mary Anne has a strong positive presence on Facebook and she actually takes the time to connect with people. I was already familiar with some of her wonderful tales regarding letter exchanges between her and friends from her books. Through my recent interactions with her though I have had the chance to observe on a more personal level her incredible generosity and her very caring ways, so it came as no surprise when I learned she was releasing a book about friendship called US! Celebrating the Power of Friendship. I was then incredibly honored to be contacted by her publisher to see if I would take part in a Mary Ann Radmacher blog tour. No one had to ask me twice! There was also the fact that I have been noticing a trend here on my own Red Boa blog, which is that the two most popular and most read posts are on friendship and belonging. I believe that we humans experience the most joy and deepest sorrows in regards to our relationships. They are what keep us going, and sadly at times, are what drag us to the depths of grief and loss. It appears that the topic of friendship is one that draws many to seek advice and answers. 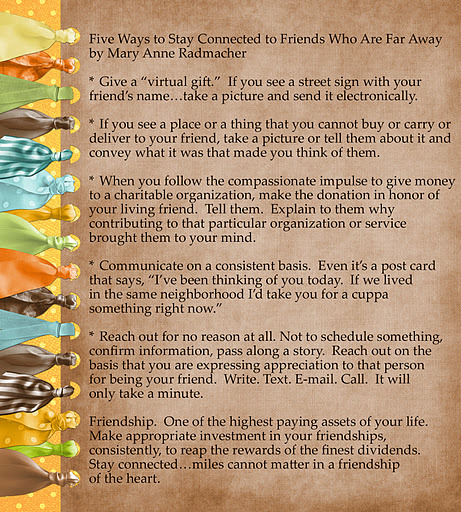 If you are seeking some guidance regarding friendship you have come to the right place. Here are some words of wisdom from Mary Anne Radmacher herself regarding friendship. 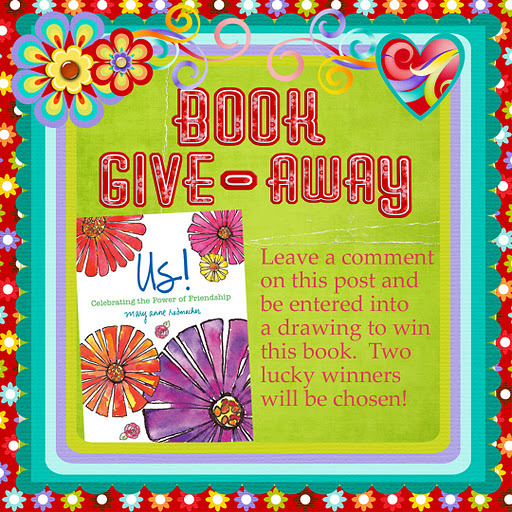 Special Note – Don’t miss the opportunity to win a FREE copy of US! Celebrating the Power of Friendship. See details below! 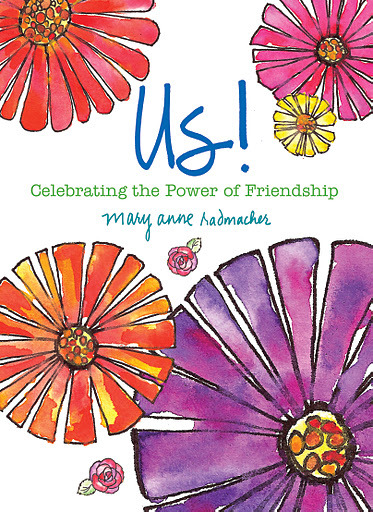 10 Questions with Mary Anne Radmacher about Friendship and US! What inspired you to write a book about friendship? Was there a particular friend that kindled the idea? My friend, Maureen, was a high school senior when I was a sophomore. When she graduated she gave me a book of quotes about friendship. I knew when I finished enjoying those great thoughts that someday I would write a book on friendship. When I was 19 I operated a switchboard for a small college in San Francisco. In the quiet moments, I would work on my friendship book. A teacher who stopped by my desk each day, Professor Sparks, greeted me with an unusual question – “What dream are you working on today?” I easily and quickly replied, “My book on friendship.” Thirty five years later US! CELEBRATING THE POWER OF FRIENDSHIP features some of the things I knew and treasured about friendship when I was still a teenager. Why is friendship important – to women especially? I first want to say that I believe friendships are very important to men – and I have observed that they deal with it and talk about it (when they talk about it at all) differently than women. Women want to affirm, support, validate what they know to and for each other. Women have an increasingly demanding set of roles to fulfill in our culture, and our friends help us “suit up” for those various tasks. Women friends offer each other support that is both tangible and metaphysical. Is friendship more important than familial relationships? As important? The answer to that question depends on the nature of one’s relationship to family. I was born around the time my parents were celebrating 25 years of marriage. Two of my siblings could have been my parents. The participants in my family structure were either a) tired or b) involved in their own life activities. From early on I learned to create my own “tribe” first from the neighborhood, then school, then peers in my life experiences. My friends, in all practical applications, have been like family to me. Why do we need to take time out to appreciate our friends? Everyone leads busy lives, and our friends certainly understand that. The busier I am the more conscious I am of how important it is to stay connected to my friends. It’s too tempting to relegate our friends to the back of the line. When, in fact, our relationships are one of the greatest graces of our lives. What are some easy ways to show our appreciation? I’m a BIG FAN of the postal service. Sending a fun or meaningful card “just because” is a real tender connection between friends. I use technology to take photos with the short caption, “I saw this and it made me think of you.” I’m encouraging groups of friends to use my US! book as a “scrap book” or to use an older term , “autograph book.” Each member of the circle has a copy and each book gets passed around. Friends write their own thoughts of appreciation on the page that most reminds them of their friend. Combining my words and illustrations with loving words from your own friends – a powerful and memorable combination. Being cued in to the present and real struggles a friend is facing is important. More than saying, “Let me know if there’s anything I can do,” DOING something practical really shows how much you appreciate your friend. My friend is moving this week. She has a two hour daily commute. AND she has special food needs with a variety of allergies. I made allergy-appropriate lunches for her for a week. I said, “I know when you are moving you don’t even know where your kitchen utensils ARE! I hope this makes making good, healthy choices easier for you this week.” It got a big WOW from my friend. As we get older, it becomes more and more difficult to establish new friendships. Why is that? Age brings a certain predictability and a whole road of judgments and assessments at our backs. It becomes very easy to judge someone in advance and tell ourselves all the reasons why we likely wouldn’t like this person or that. Also, we’ve had a few friendship failures as we’ve gotten older and might be less inclined to be vulnerable. My dad outlived all his old friends and he told me one of the regrets of his life is that he did not take the time to make new friends. My life is like a shelf on a bookcase. My oldest and my newest friends are the book ends that hold all the other books together! What are some ways to foster new relationships? Be open to people who are different than you. Say yes to experience new gatherings and go to events that are a little out of your comfort zone. 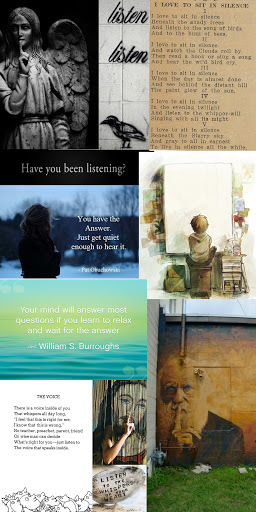 Listen attentively and observe how you feel listening to this new person. If you are immediately engaged, interested and alert…that might be an excellent basis for exploring the possibility of a friendship. If someone says, “We should talk about that,” or “I’d love to get together sometime and learn about your experiences with_________,” schedule the time. Sometime soon. Listening is an excellent way to foster a new relationship. And it’s also a litmus! If you find yourself endlessly listening with no opportunity to speak, that might be an indicator of a relationship you want NOT to foster. 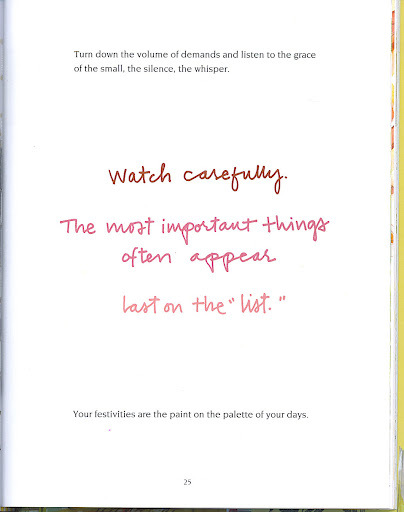 That’s important to pay attention to, as well. Not everyone you meet would make a good friend for you. If you could plan a perfect night with a friend, or group of friends, what would that be? I get to have quite a few of those kinds of nights. We share healthy and yummy food, work on some sort of art project and tell each other fabulous stories. Most of them even true! What is your advice for people who have grown distant from friends, and don’t know how to change that? Reach out. Take the risk and say, “I miss our times of connecting. I thought of you just the other day and remembered the time that we…..” Sometimes just confessing that you’ve noticed some distance has crept in will be a relief – they have likely noticed it, too, and haven’t known what to do, either! We can’t talk about your books without mentioning the artwork. Do your friends inspire you, advise, you or in any way assist you in your creative life? My friends deliver honest advice and critique when I ask for it and otherwise have an abundant supply of “Ooooooh’s” and “Ahhhhh’s.” That sweet celebration is like the warmest, softest sweater on a chilly afternoon. The finest compliment I get from any of my friends is when they purchase my work and give it as a gift to their other friends. Not only are they supporting my career but they are affirming that what I communicate has functional value to them. That means so much to me. 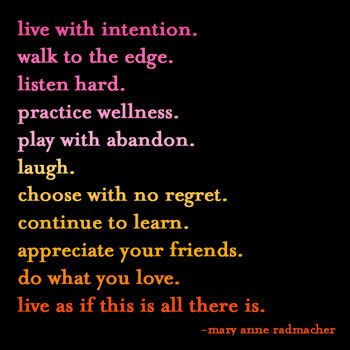 Some additional words of wisdom from Mary Anne Radmacher. Do you have any words of wisdom regarding friendship? 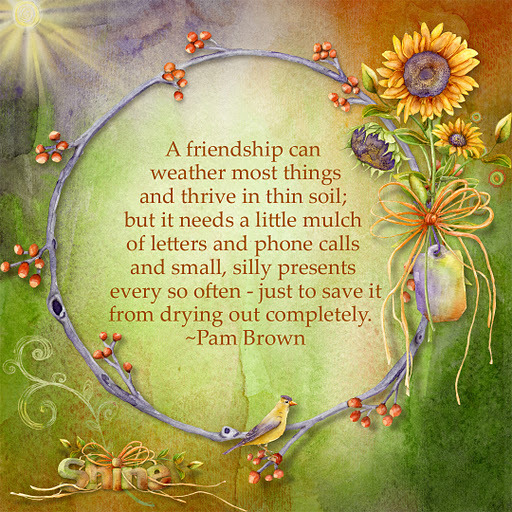 How do you nurture your friendships? 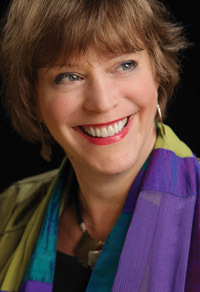 The words and work of Mary Anne Radmacher have circled the globe on products, quotes in books, been included in speeches, are part of ceremonies from graduation to weddings to memorial services. 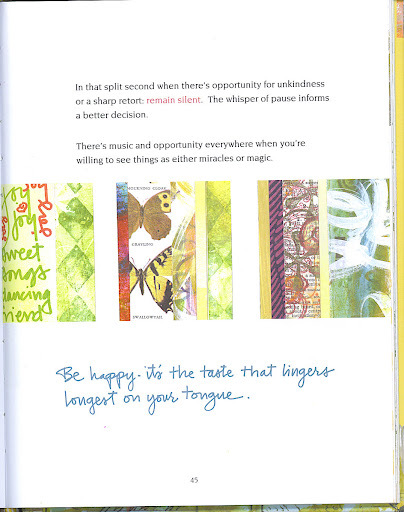 Radmacher’s words are woven into media from Oprah’s Harpo Studio headquarters, commercials, to being quoted in newscasts from the 2011 Tour de France coverage to the evening news with Diane Sawyer. 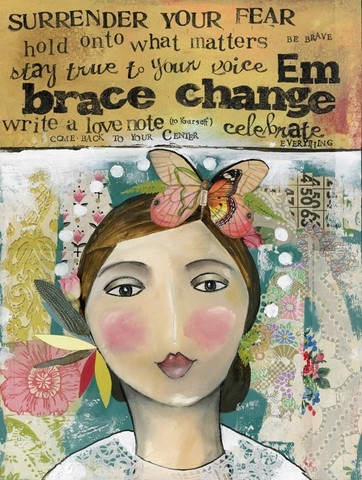 Her signature posters are in board rooms and school rooms, adorn hospital halls and homes around the world (and found at maryanneradmacher.com) and her work is visible from the Clinton Museum Store to gifts store on the corner. You can find US! Celebrating the Power of Friendship here. Her previous book LIVE WITH INTENTION was also just released as an ebook and can be found here. What do you think of this poem called Live with Intention? 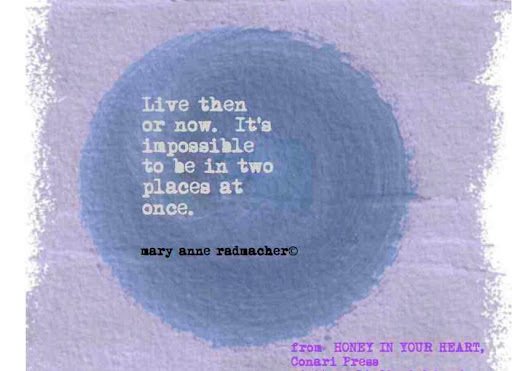 Mary Anne Radmacher , the author of the poem, often has her profound writing quoted. Mary Anne has a powerful way with words and has written the following inspiring books: Lean Forward Into Your Life, Live Boldly, Promises to Myself, Courage Doesn’t Always Roar and May Your Walls Know Joy. 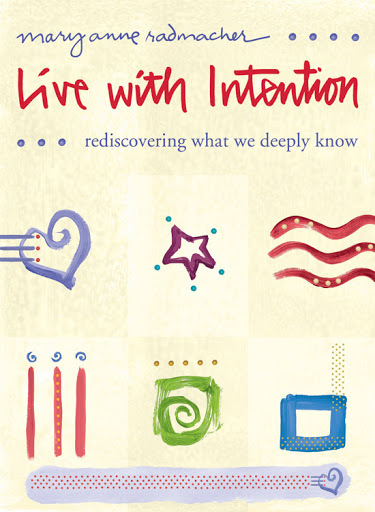 Her latest book is called Live With Intention: Rediscovering What We Deeply Know. 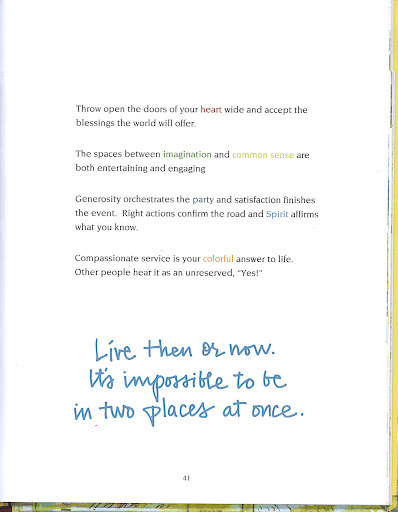 In this latest book here is what Mary Anne has to say about her poem Live with Intention. If we do everything else but that one thing, we will be lost. And if we do nothing else but that one thing, we will have lived a glorious life. How does one do that… “Observe your life. Watch how your days unfold. Notice what invigorates or inspires you. Pay particular attention to the things for which you have unbounded energy and excitement. Making a list of these things is especially helpful. Some things are so deeply embedded into our experience, it can be difficult to see them. Part of this observation process involves being aware of what tires you, burns you out in an undesirable way. Perhaps there are events in which you are regularly involved that seem significant, but upon closer examination, you find actually drag you down, rather than elevate you. Many discover that their most significant intentions get the least amount of attention. 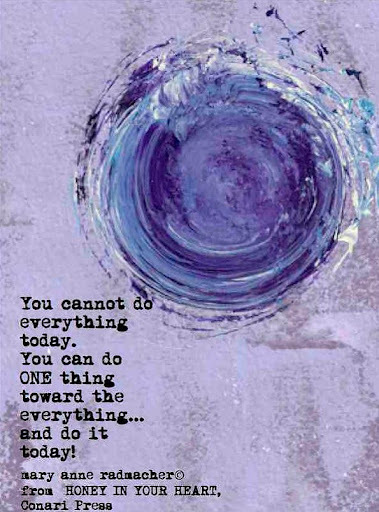 Oddly, the ‘one thing’ to which Rumi makes reference is often the last thing on lists of things to do. It is that proverbial carrot that is saved for a someday that hardly ever comes. Do you know the one thing or the collection of things that together comprise the ‘one thing’ that invigorates all your actions and sets you on fire? If you know it, do you measure the activities and focus of your day by it? If you do not know it, how do you make decisions and what do you measure them against? Do you already know “your one thing?” or are you still seeking? 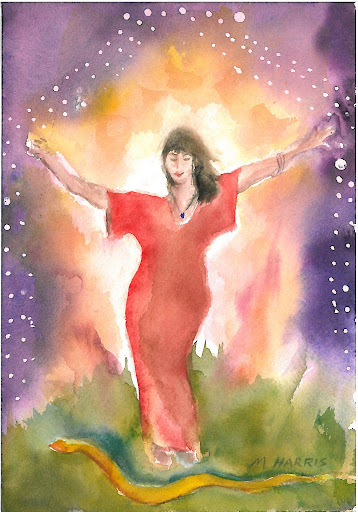 If you are still uncertain and exploring, consider using Mary Anne’s recommendations to discover your intentions. As we stand on the edge of entering into a new year, this too can be a most opportune time to focus and set some goals and make decisions on what you want to accomplish. Cosmic Cowgirls is also offering a new session of Spark in January and March! Sparking is a great way to set an intention and really give it daily attention and focus. You can learn more by clicking here. 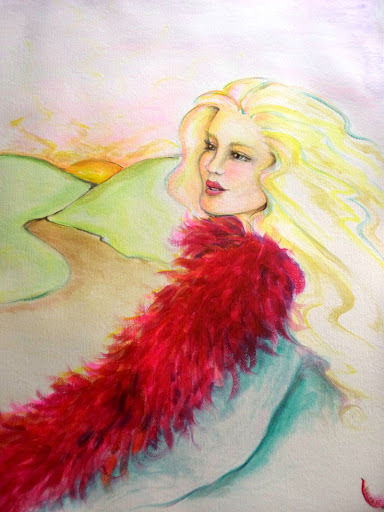 I’ll leave you with a special new piece by Mary Anne that she shared on her web site. She writes “This is from a new piece I’m working on. If it inspires you it’s a gift: download it and use it for any non- commercial use. The title of the poem is THIS IS WHAT YOU SHALL DO. 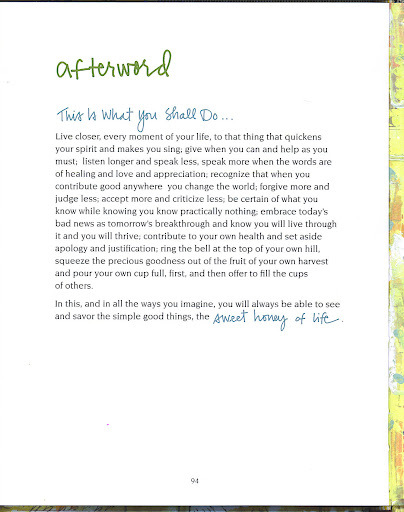 I feel strongly that it may take a place alongside LIVE WITH INTENTION as a legacy piece of my life’s work. The full version is going to be available as a time limited new year’s edition. I’ll keep you posted on that. There are so many quotes that I love that I am sure I could fill a book with them. 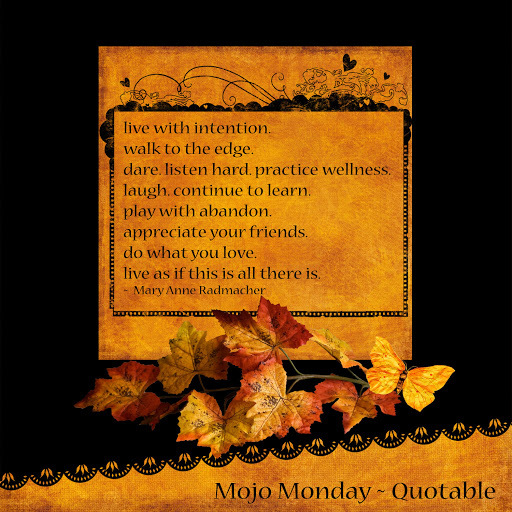 So when I thought about writing a post for Mojo Monday on quotes I realized I needed to perhaps fine tune what I wanted to share. In effort to do so I thought I would focus on one writer/artist who I find to be incredibly quotable ~ Mary Anne Radmacher. perserve. plan. strategize. focus. breathe. write. let go. forgive. relax. all this failing… take a nap. the jump is so frightening between where i am and where i want to be… because of all i may become i will close my eyes and leap! 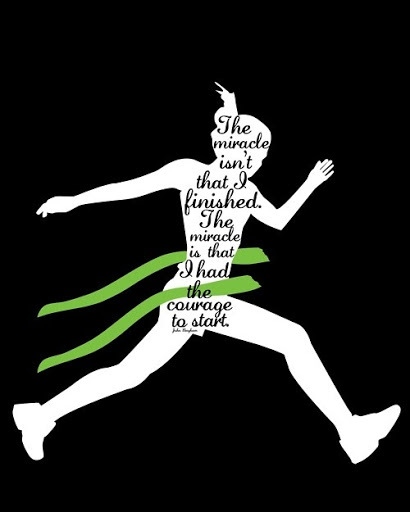 a key to a vital life is an eagerness to learn and a willingness to change. because i call it challenge rather than crisis; because i look at hardship as opportunity instead of obstacle; because at the end of a matter, i ask, “what will i learn from this to make me better?”; because i take a deep breath and do the difficult thing first; because my courage does not depend on the weather, the economic forecast or the winds of whim; because i know the most significant elements in my day are laughter, learning and applying my finest efforts to each endeavor; because of these things each morning is a pleasure and every day passed is a success. all i know is… you can get there from here. you can. you can walk through the fear. travel past what is gone before. wake up! wake up and get up on the other side. dare to become that of your dreams. dare! dare to believe in your own possibility. wishes. 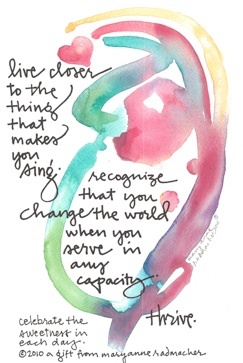 i wish for you the color that you bring forth in others to greatly rise within you. i wish you your own best strength. i wish you always loved ones at your side. i wish you desired possibilities before you and contentment behind you. i wish you the beginnings of all your dreams and many of the ends. i wish you peace. Mary Anne Radmacher is on Facebook and has a website. Is there a particular writer whose words you find to be quotable.